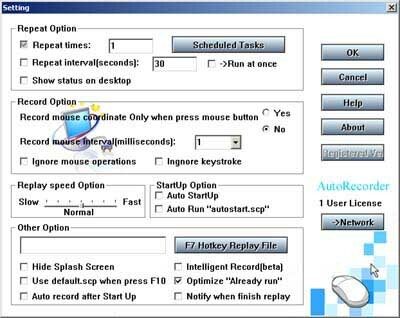 Auto Macro Recorder is a useful macro program for you to record mouse macro and keyboard macro to editable script file,then repeat it as you wish.If you want to get an easy-to-use macro record tool,try it!! All-purpose macro program for you! Very easy to use! Just Record -- Save -- Replay 3 steps. You don't need to have any program experiences. Now support screen caputre, you can save your operation to avi files! Support Multi languages - English , Dutch , German , Japanese ......Use "Change Language" to change the language. Support Win8 / Win10 ! Auto Macro Recorder support Windows Vista!